After taking a few years off “soul-searching,” Canadian indie rocker foursome Fast Romantics are back with a bang with an album described as “a good blend of blood, guts, and bliss” – their words, not ours. After the openly Brit-pop, glam-rock, Blur-meets-Costello inspired buzz of the bands self-titled debut, Afterlife Blues feels like an album from a band a lot more confident with making their own sound. There’s a playful pop-rock attitude balanced by a good dose of post-breakup melancholy (particularly in slowed-down power-pop number “Old Enough”) and a sense off all-American rock greatness underlined by an honest lyrical simplicity. The great thing about this album is its variety – no two tracks are similar enough to become boring. Made-for-summer single “Funeral Song” is the slick and detailed guitar-rock song that instantly becomes a hit on your speakers where title track “Afterlife Blues” drops the tempo and allows the vocals to take lead. Songs like “White Lights” and “Time” are more typically pop-like and hook-heavy, and while this influence can also be heard on opening number “Friends” the track has a rougher rockier edge (with complimenting layered vocals) that makes it instantly compelling. 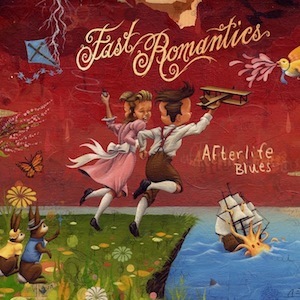 Sure, there’s nothing here that many bands haven’t done before, but the Fast Romantics take the best of a multi-genre bag of influences and pull them together in an record that, for all its genre straddling sounds, is quality indie rock to its core.